Everyday, we spend our time moving from once place to another for whatever purposes. For most of us who travel a lot or simply have a lot of client meetings in places other than your office, you may have consulted Google Maps one way or the other. Indeed, Google Maps have replaced conventional maps in finding your way to your destination especially in an increasing mobile culture. Download Google Maps in your Android, Blackberry or iPhone and you have directions in a click. In terms of tourism, Google Maps has helped one find tourist spots one has never heard or seen before. Places like Guiuan, Samar; Sipalay City and Apo Island in Negros; and Siquijor Island are beginning to be known for tourist thanks to Google Maps. 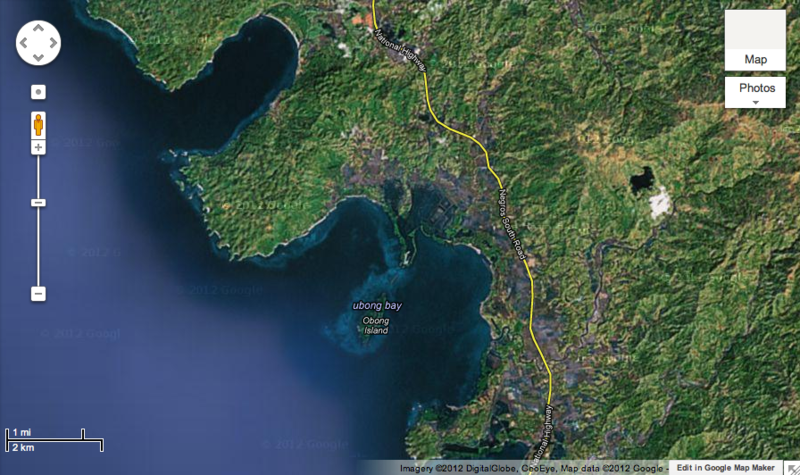 In the Visayas, major cities have been accounted for with the latest satellite images. Bacolod City is one of the most updated cities with its numerous constructions happening around the city and its metropolitan component cities of Silay, Talisay and Bago. Even as it is regularly updated, only a few volunteers are doing their part of the editing and is beginning to be a challenge with more building and road constructions. 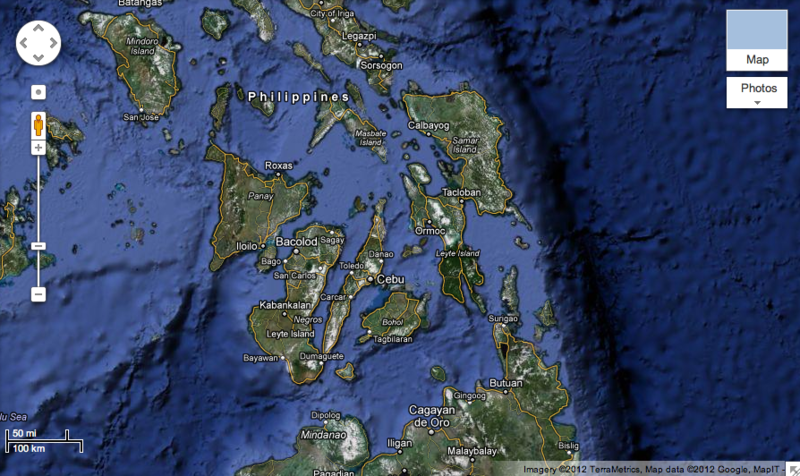 Blind spots or areas without a high-resolution satellite image still exist in Negros Island. While Mambukal has already been accounted for after being in the spot for three years, a big chunk of Sipalay, Candoni and the entire Hinobaan still falls within the blind spot. Daunting since Sipalay and Candoni are home to nice white-sand beaches with dive spots while Candoni is home to countless unexplored caves in pristine condition. Not only is Google Maps helpful in tourism, it has proven its worth time again in dispatching relief in times of disaster. Two disasters have hit the eastern portion of Negros Island in Negros Oriental with the onset of Typhoon Sendong and the Negros Quake in Tayasan, Negros Oriental. Google Maps was used to tag places damaged by the disasters and in need of relief goods with relief centers and relevant facilities. With the increasing importance of Google Maps, there is a need to update and revise some areas of the Google Maps from time to time. Editing is by contributor basis with all of the editing done in a Google Maps support application called Google Map Maker which is a free for all access for geographic and map enthusiasts. 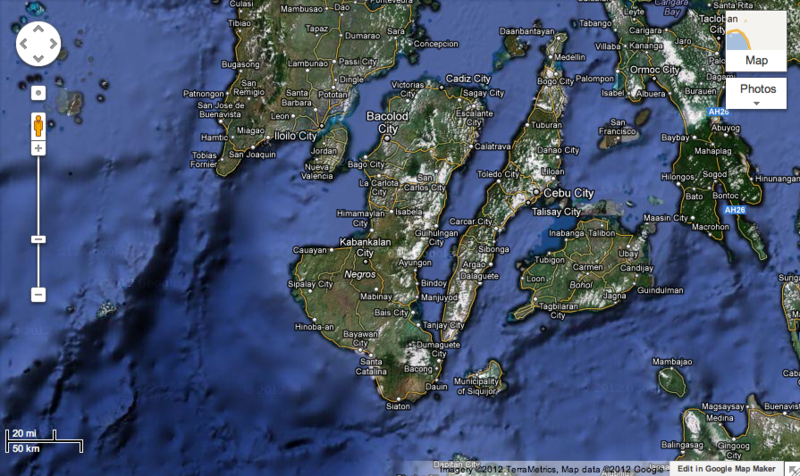 The Philippine Group of Google Map Maker Editors and Enthusiasts are organizing a Google Map Maker Summit in the Visayas at the University of St. La Salle – Bacolod City on April 12, 2012 to promote Map Maker awareness for Visayans, particularly Negrenses. The session from 8:30am to 5:00pm will delve on introduction to Google Map Maker, current work undertaken by Philippine editors with current and potential uses of Google Maps and hands on lessons for first timers or neophytes to Map Maker editing, Panoramio and Sketch Up, a Google Application that makes 3-D models of buildings found on Google Maps and Google Earth. Since it involves computer work, so everyone is requested to bring their own laptop. Worried with what could be the registration fee? No problem since its completely free, an advocacy to help promote disaster relief and tourism efforts especially the recently-launched “Negros Island. Sweet Spot of the Philippines!” tourism campaign. Everyone is welcome but you need to register online with your Map Maker account and niche indicated. Unfortunately not in Bacolod City for that Summit? No problem since they will also be holding summits in Luzon at the University of Baguio on April 14 and in Mindanao at STI College, General Santos City on April 21. Make your summer productive by being part of something that can help you and others in the long run, so log in and join Google Map Maker Summit in the Visayas now.